Give me back my anxiety chair! 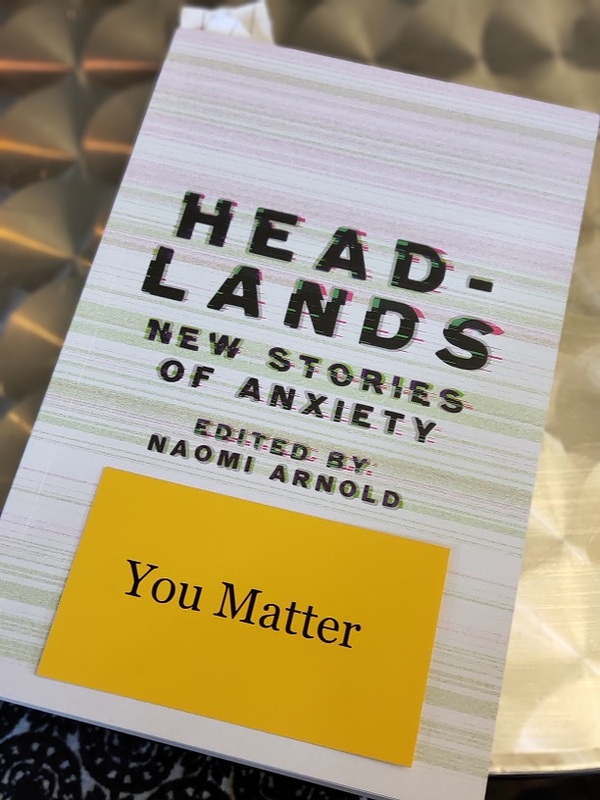 Working my way through the impressive and throat-gripping essays in new anxiety anthology Headlands, I’m struck by two things. How unique each story is – and how each one is the same. So many of us battle with mental illness, and so many of us do it in the dark. The darkness of stigma, the darkness of denial, the darkness of silencing and isolating. Whether we do those things to ourselves or have them done to us, the result in the same. It’s cold down here. Headlands doesn’t thrust us into the light – but it does open the curtains, just a little. We can see out, and others can see in. I imagine us – the writers, pulling back, blinking warily. Then, when the warmth starts to seep in, in the form of all the people I have seen saying “oh, my god, same” – we can creep a bit further forward, the sun catching our fingers, pulsing in our hands. In Hinemoana Baker’s essay – a raw and challenging account of trauma spanning her lifetime – she recounts the voice in her head. ‘No one will ever want to read this, why don’t you try putting some happiness into the world instead?’ I studied with Hinemoana and her honesty and bravery has moved me to tears on many occasions, as it did here. From what I’ve heard from the other writers, many of us felt this; a burden to provide happiness, to be happy even when we are not. And no matter how many things we accomplish, how many articles or books we publish, how many people respond positively to our work – we still think it. No one will ever want to read this. I’ve been practicing naming those voices in my head – the ones that say negative, cruel things, the ones that gnaw at me with exhausting refrains about my lack of worth. I’ve been privileged, though it does not feel that way, to have access to mental health care from a young age, so I know the names of those voices. You’re not good enough, why even try? – that’s depression. What if I never measure up? – that’s anxiety. That’s not good enough, do it again – that’s Obsessive Compulsive Disorder. It’s complex and there’s a lot of overlap, but it does help to be able to identify and name the thought pattern. Somehow, that reduces its power. I like logic. I like explanations. I don’t like messiness – which is unfortunate, because we’re human, and being human is all about mess. Recently I realised something about my disorders. I still don’t think they’re “enough” themselves, enough of an explanation or a defense. So I’ve spent a lot of time picking apart my head, looking for answers for why I feel how I do. And when that happens… I choose something. I would rather obsessively, anxiously ruminate over one thing for days, that just accept that I have depression, and sometimes I will feel awful with no logical explanation. Choosing a reason to be sad makes me feel more in control of being sad – more like my emotional state is valid. I used to think I was just an attention-seeker, looking for any excuse. Now, I think I see the pattern. It’s better to choose to be sad about something, than to be at the mercy of my own neurobiology. I don’t think this is working or healthy and I’m not recommending it, just to be clear. Someone suggested to me that my worrying is a sort of anxiety vaccination. If I dose myself enough, over time, I’ll build up resistance, and inoculate myself against a meltdown if something terrible actually does occur. A good concept, and it kind of plays into something my life coach said – I know, I know, “life coach,” but Cher has taught me a lot about my value systems, about how to deal with conflict, about how to approach things differently with my own internal conflicts. The first day I walked into her office, she asked me what I was there for and I said “to get rid of my anxiety,” and, you know, she reminds me often she’s not a therapist, but boy can she do That Silent Look really well. Anyway, Cher teaches using psychodrama, which is fun roleplay where I get to pretend to be people I hate, and then cry. It’s a good time. IIn that first session, Cher set out three chairs: two side-by-side, and one in front on the right. I sat in the chair behind it. Cher sat alongside and asked me logical questions and I gave logical answers. That chair was Logical Me. We swapped places and I was Current Illogical Me, attempting to paraphrase my sensible thoughts. Then I sat in the front chair, which was when things got real, cos that chair was Anxiety Me. I hyperventilated, a little bit. All I could see was the Me chair, all exposed, nothing in front of it. I couldn’t believe it – I wanted the Anxiety chair back. I think that, having read almost all of the essays in Headlands, so many of the writers would relate to this. We hate our anxiety and the traps it snares us in – but most of us have had trauma that caused us to develop this way of protecting ourselves. I told this to my dad the other day and unfortunately for me, my dad is a counsellor, so he always says really smart things and it’s incredibly annoying. He was encouraging me not to worry about some future possibility, and I was insisting that I had to. I don’t think I’m going to be undoing the complex relationship I have with anxiety any time soon, if ever. But reading Headlands has made me see that many people I deeply admire have their own relationship, managed in all sorts of different ways. I admire deeply Rebecca Priestley, who travels often in her work as science journalist and whose essay takes place in Antartica. I have panic attacks getting on a plane to Auckland. I admire Aimie Cronin and Holly Walker who’ve shared the particular anxieties relating to pregnancies and parenthood. I admire Kirsten McDougall whose essay exploring the origins of her illness is so similar to my own journey but much much more beautifully written. 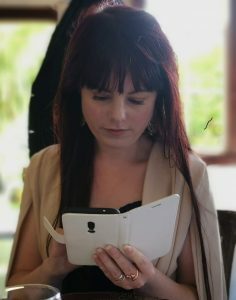 I admire Jess McAllen, who’s experience I’ve been a sort-of part-of, the way we are with social media. I admire Ashleigh Young, in fact once I’d read her piece I tried to back out because I was like wait no this is incredible I can’t be anywhere near this. It’s chilling and so, so validating. I admire all 31 people who have been so vulnerable. 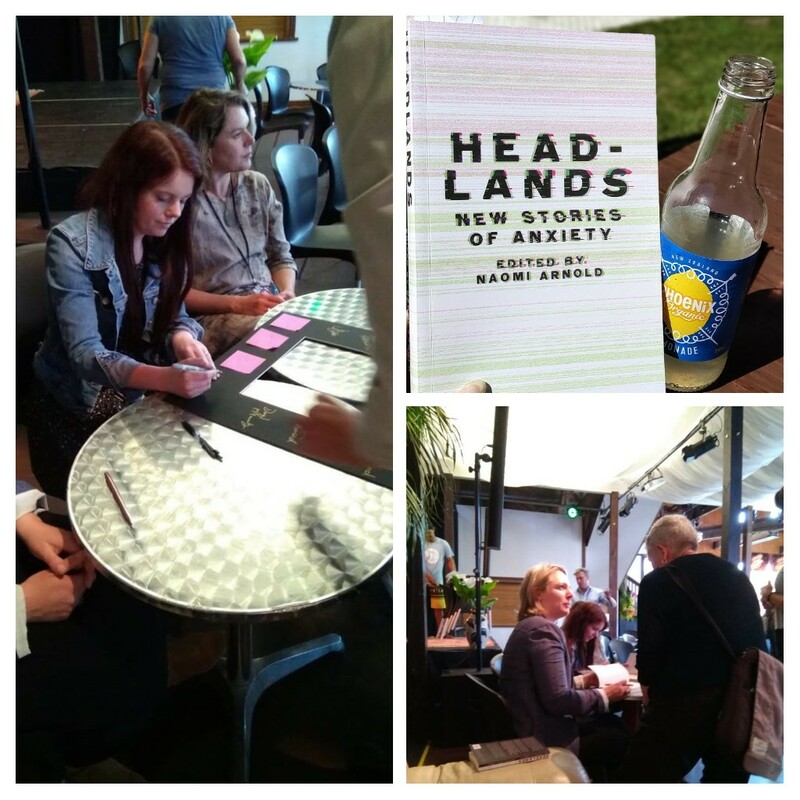 Headlands has been on several bestseller list and there’s a reason for that. Anxiety isn’t a wildfire or a flash flood, it’s an invisible web. We don’t know who else is in the web until we start pulling. Then the movement spreads. Headlands puts significant weight on the web and draws us in. The opposite of mental illness is, apparently, human connection. Feeling seen. Special thanks must go, as I have said, to editor Naomi Arnold who came up with the concept and pursued it tirelessly. Anxious, we rise. Anxious, we do not rise alone.